Markets are initially surging higher off the Fed's latest statement, as shorts into the meeting are getting squeezed quite violently. 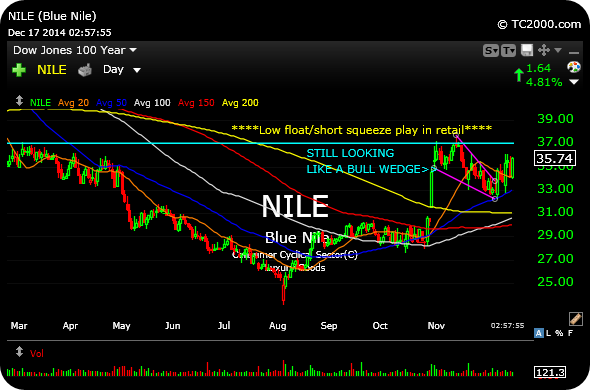 If we do see some a reprieve from the selling into Christmas, I still think Blue Nile can outperform, seen bouncing back nicely on the daily chart, below. $37 remains the trigger above, but the low float/short squeeze play is basing well under that well-defined resistance. Nonetheless, I remain skeptical of today's rally. It will be interesting to see where we close the session, once again, given the recent pattern of sharp late-day fades. In a standard market correction, traders are often lured into exuberance bounces only to fall victim to an abrupt rollover to new lows. Also note the giveback in crude oil, back to red or flat, from the sharp rally it enjoyed earlier today--Picking bottoms is not for the faint of heart even if you are correct.